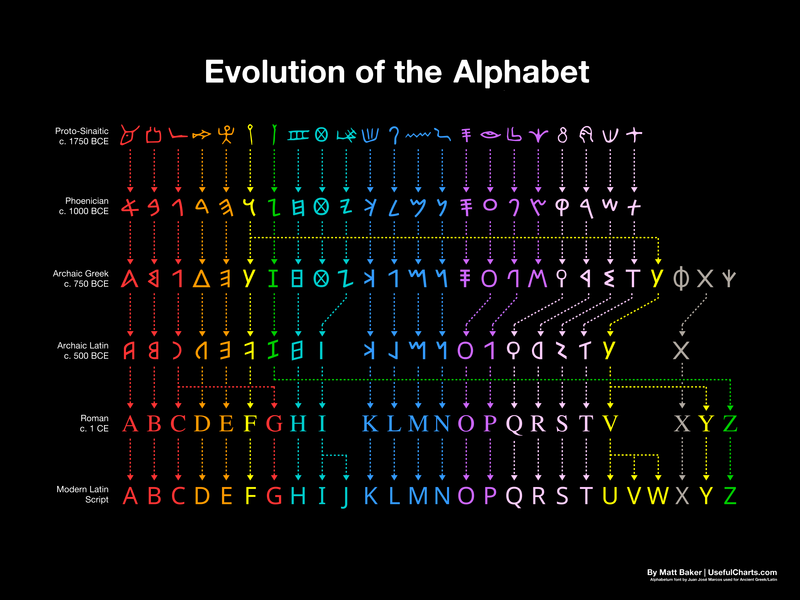 This alphabet evolution is a part of a larger wall chart that encompasses Writing Systems of the World, which is for sale on Baker’s site. This beautiful wallchart outlines 51 different writing systems from around the world, divided into abjads, alphabets, abugidas, syllabaries, logosyllabaries, and signal-based alternatives. Includes: Arabic, Armenian, Bengali, Braille, Burmese, Chinese, Ethiopian, Georgian, Greek, Gujarati, Hebrew, Hindi, Inuktitut, Japanese, Kannada, Khmer, Korean, Lao, Malayalam, Morse Code, Oriya, Russian, Punjabi, Semaphore, Sinhala, Tamil, Telegu, Thai, Tibetan, and more… over 2000 symbols total!